Erect, single-stemmed monocarpic rosette shrub, or, if branched, polycarpic and erect or decumbent; flowering plants commonly up to 2 m high. 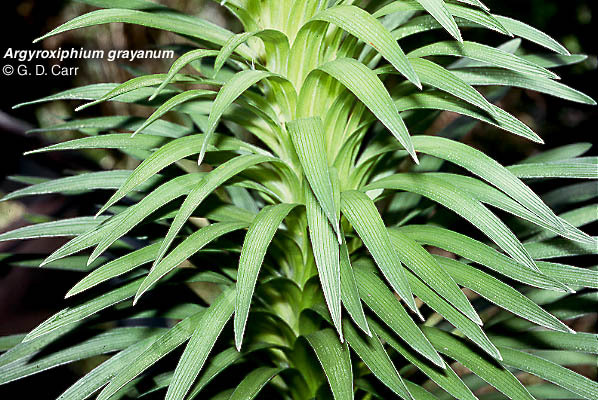 Diagnostic features of the species include green, 5-11-nerved, narrowly elliptic-ligulate leaves which are broadest above the middle, and pappus of disk florets mostly 1-2 mm long. 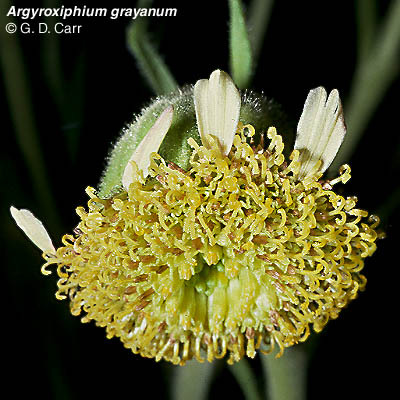 Flowering occurs from June to January, apparently peaking in August. 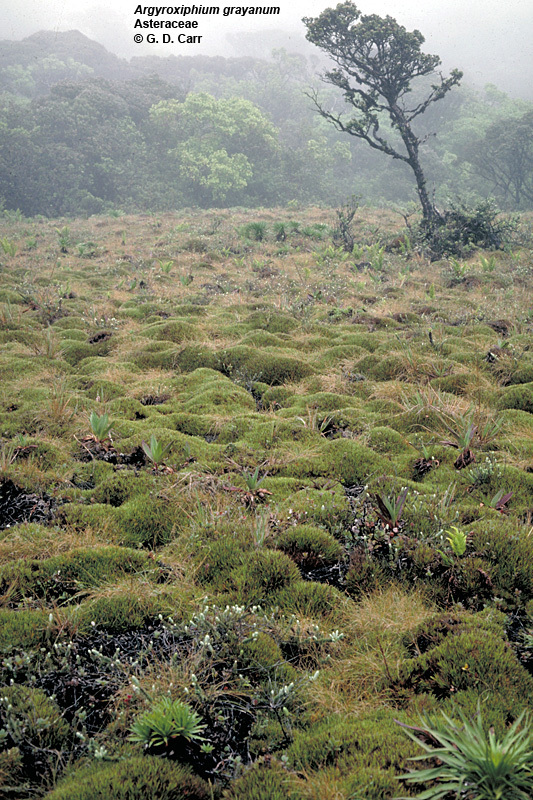 This species occurs on E Maui and W Maui, mostly in and on the perimeter of bogs at elevations ranging from about 1,200 to 2,050 m. It occurs in sites receiving about 150->1,000 cm precipitation per year. Although occasionally locally abundant, populations are usually very restricted in area and of limited distribution. 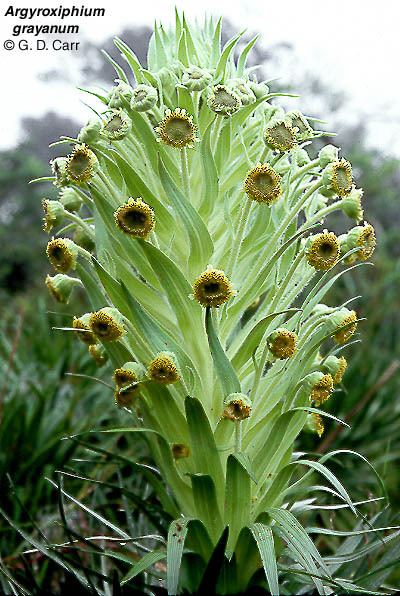 Lower portion of flowering stalk of plant cultivated at Hawaii Volcanoes National Park The lack of a silvery coating of hairs distinguishes greenswords from their close relatives, the silverswords. (photo 1977). 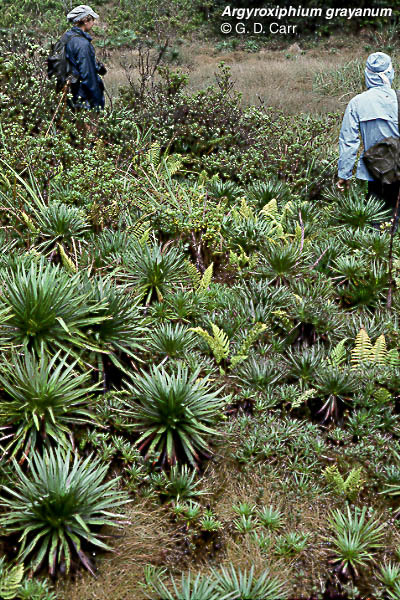 Greensword habitat on E Maui, two vegetative greenswords visible in foreground of Oreobolus bog (photo 1977). 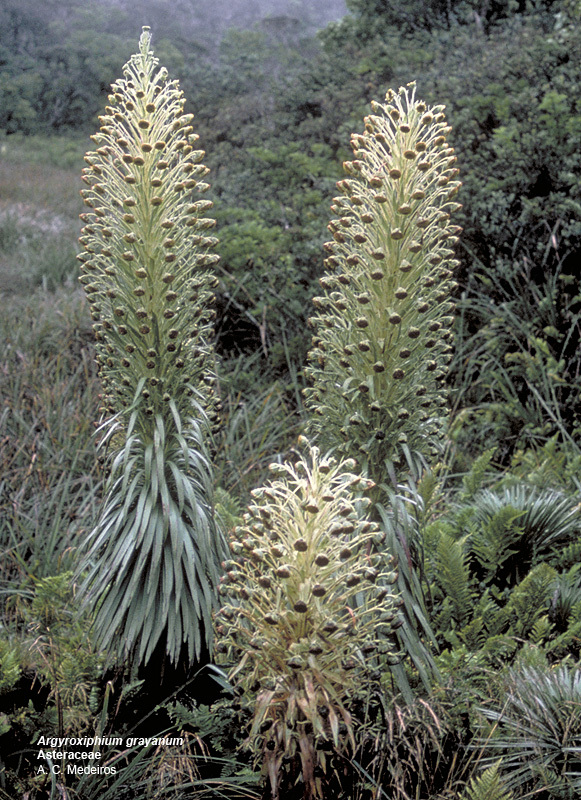 Greenswords in flower, "new" bog, E Maui (photo 1983). Greensword admired by Art Medeiros, E Maui. 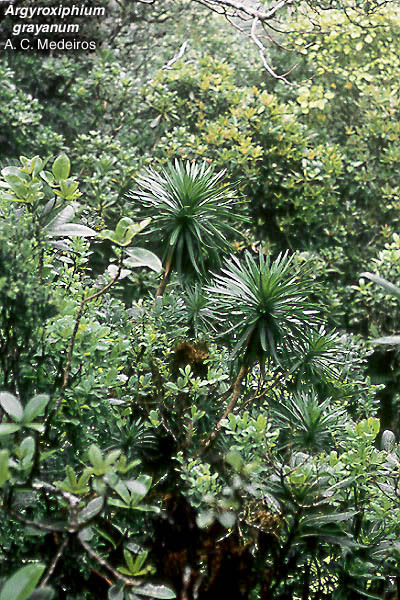 "Greensword Meadow," E Maui (photo 1977). 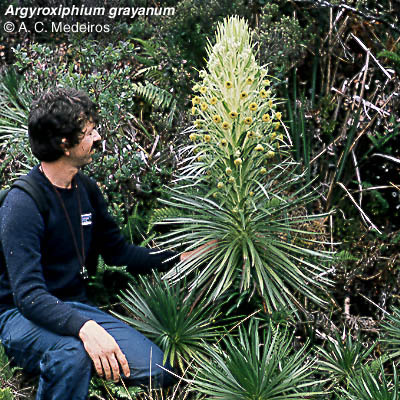 Flowering head from greensword in cultivation at Hawaii Volcanoes National Park (photo 1977). 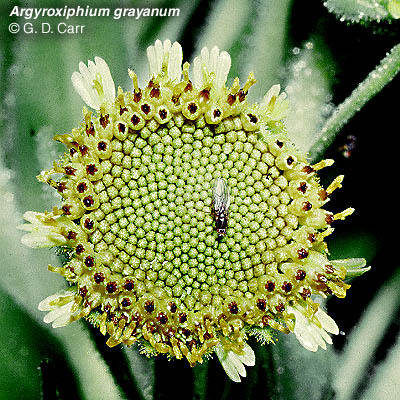 Flowering head with presumed native tephritid fly whose larvae parasitize the fruits of the greensword. 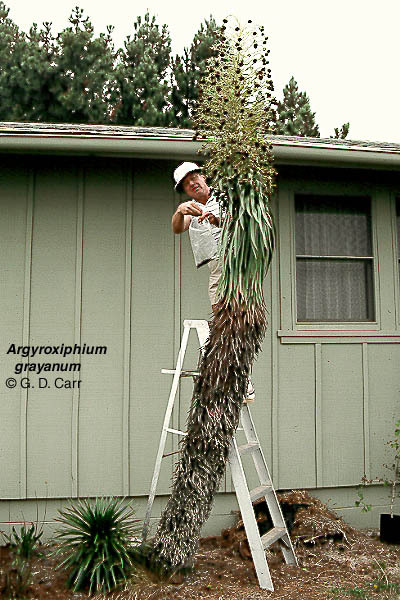 "Jack-in-the-beanstalk" Kyhos harvesting a few fruits from the world's tallest greensword, a plant cultivated at Haleakala National Park (photo 1985).